The Karmapa (honorific title His Holiness the Gyalwa (རྒྱལ་བ་, Victorious One) Karmapa, more formally as Gyalwang (རྒྱལ་དབང་ཀརྨ་པ་, King of Victorious Ones) Karmapa, and informally as the Karmapa Lama) is the head of the Karma Kagyu, the largest sub-school of the Kagyu (བཀའ་བརྒྱུད, Wylie: bka' brgyud), itself one of the four major schools of Tibetan Buddhism. The historical seat of the Karmapas is Tsurphu Monastery in the Tolung valley of Tibet. The Karmapa's principal seat in exile is the Dharma Chakra Centre at Rumtek Monastery in Sikkim, India. His regional monastic seats are Karma Triyana Dharmachakra in New York and Dhagpo Kagyu Ling in Dordogne, France. 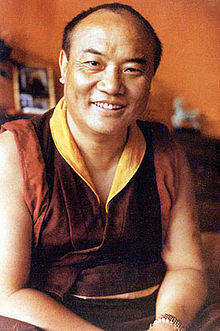 Due to a controversy within the Karma Kagyu school over the recognition process, the identity of the current 17th Karmapa is disputed by some. See Karmapa controversy for details. Düsum Khyenpa, 1st Karmapa Lama (Wylie: Dus gsum Mkhyen pa, 1110–1193), was a disciple of the Tibetan master Gampopa. A talented child who studied Buddhism with his father from an early age and who sought out great teachers in his twenties and thirties, he is said to have attained enlightenment at the age of fifty while practicing dream yoga. He was henceforth regarded by the contemporary highly respected masters Shakya Śri and Lama Shang as the Karmapa, a manifestation of Avalokiteśvara, whose coming was predicted in the Samadhiraja Sutra and the Laṅkāvatāra Sūtra. The source of the oral lineage, traditionally traced back to the Buddha Vajradhara, was transmitted to the Indian master of mahamudra and tantra called Tilopa (989-1069), through Naropa (1016–1100) to Marpa Lotsawa and Milarepa. These forefathers of the Kagyu (Bka' brGyud) lineage are collectively called the "Golden Rosary". Karma Pakshi, 2nd Karmapa Lama (1204–1283), is often said to be the first person ever recognized and empowered as a tulku (Wylie: sprul sku), a reincarnated lama (bla ma). The Karmapas are the holders of the Black Crown (Wylie: Zhwa-nag) and are thus sometimes known as "the Black Hat Lamas". This crown (Wylie: rang 'byung cod pan "self-arisen crown"), is traditionally said to have been woven by the dakinis from their hair and given to the Karmapa in recognition of his spiritual realization. The physical crown displayed by the Karmapas was offered to Deshin Shekpa, 5th Karmapa Lama by the Yongle Emperor of China as a material representation of the spiritual one. The crown was last known to be located at Rumtek Monastery in Sikkim, the last home of the 16th Karmapa, although that location has been subject to some upheaval since 1993 causing some to worry as to whether or not it is still there. An inventory of items remaining at Rumtek is purported to be something the Indian government is going to undertake in the near future. ^ "Karmapa Concept Encyclopedia Analysis". Collab.itc.virginia.edu. Retrieved 2011-10-17. Thinley, Karma: The History of the Sixteen Karmapas of Tibet, Boulder, Prajna Press 1980. Douglas, Nick; White, Meryl: Karmapa, the Black Hat Lama of Tibet, Milano 1975. The history of the Karmapa lineage, including biographical details of the historical Karmapas, can be found at the following web sites. Notice that the websites are written to those loyal to one or other of the rival 17th Karmapas, and their accounts of previous incarnations may not be written from a neutral point of view.